A varied walk from Plumpton to Lewes Stations taking in the low weald, the high downs, the banks of the river Ouse and the historic town of Lewes. There are hourly trains from Lewes to Plumpton at most times of the day. Trains run to Plumpton from London Victoria, East Croydon, Haywards Heath, Eastbourne and Hastings. Trains run to Lewes from all these places plus Brighton and Seaford. The walk can be shortened using buses to Plumpton College. Bus 166 runs 7 times a day Mondays to Fridays and 4 times a day on Saturdays, between Lewes and Haywards Heath calling at the college grounds (on the route). Bus 824 runs 2-4 times a day Mondays to Fridays between Lewes and Burgess Hill. Most services stop on the main road outside the college. This is a walk of 8 miles, with one climb of 120 metres up the face of the downs. The rest of the walk is either flat or downhill. It is possible to shorten the walk to about 6 miles by getting a bus from Lewes to Plumpton College. Ordnance Survey landranger map 198, Explorer map 122. There are toilets for customers and food at the Half Moon pub in Plumpton and the Blacksmiths Arms in Offham. There are numerous cafes, pubs and public toilets in Lewes. 1) Plumpton station has no barriers. The walk starts from the western footbridge. (The station has two) If you have come from the London direction cross the bridge and descend to the concrete path ahead of you. If you have come from Lewes walk under the footbridge and turn left to meet the path. Follow the path ahead by the side of Plumpton racecourse. A) Plumpton is a national hunt racecourse. There has been racing here ever since 1884, although there are only a few meetings every year. 2) Turn right here and then left in about 20 metres on a signed footpath which goes down the side of the farm buildings. 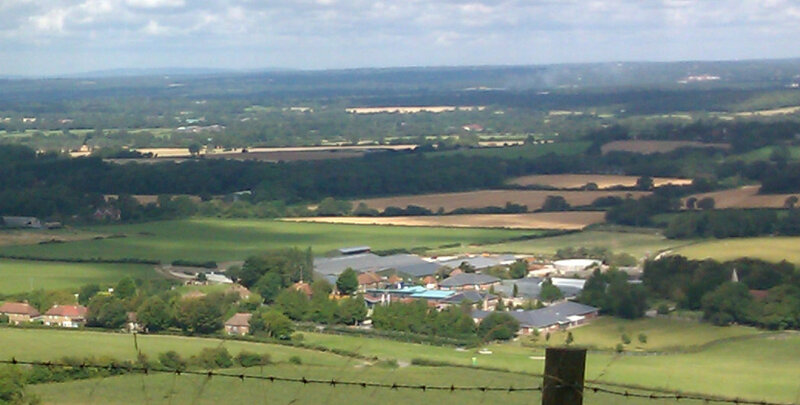 This is the site of Ashurst Organics, who deliver boxed organic vegetables to the locality. From here you have great views of the downs and your general direction is due south towards the downs and Plumpton Agricultural College. But that does not mean that the route runs exactly straight. After about 300 metres the path turns left and then right along the side of a field and then, after a further 100 metres, proceeds down the left hand side of a hedge. It then turns into a track. Near Upper Mill there is a right turn. Do not take this but keep straight ahead. You enter the grounds of the college. The route is now tarmaced. Pass the bus stop and continue along the college drive to the main road. You can turn left here off of the route for the Half Moon pub (B), which is a gastro pub with a large garden and play area. 3) Otherwise cross the road and take a bridleway straight ahead. Start to climb. The track turns left and then joins a concrete track. Turn right here up the concrete track. 4) A few metres after the junction a gate enables athletic types to turn left and take a short cut which climbs very steeply to the South Down Way above. Others may prefer to take the main route, which continues on the track, pausing frequently to admire the increasing views. See the first picture. 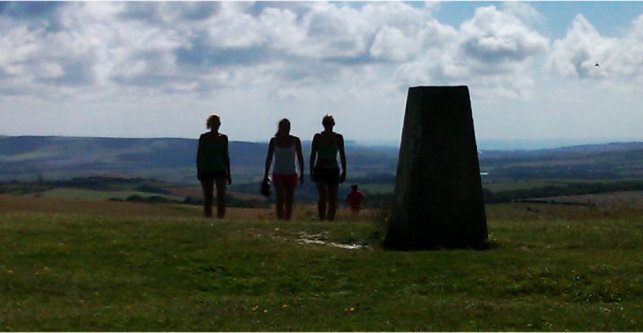 5) Reach the top and the South Downs Way. Turn sharp left here along the top of the downland ridge. Your route is fenced on both sides, but in fact the land to the north is access land, opened up as part of the Countryside and Rights of Way Act. For many years the Ramblers campaigned for the right to roam freely on uncultivated land. Most of the northern face of the downs is access land (indicated by little brown signs with white backgrounds on the ground and highlighted in brown and yellow on Ordnance Survey Explorer maps) Please do not try to get on to access land by climbing over fences. Stiles and gates are gradually being provided. The athletic alternative joins the main route along this stretch. Blackcap (C)is one of my favourite places on the south downs, with panoramic views to the north over the weald and to the south to other parts of the downs and to the sea at Brighton and Newhaven. There are trees to shelter behind if it is windy and secret places to explore in the wooded access land to the north of the summit. It was the site of pagan rituals in Saxon times. These appear to continue. See second picture. Naturalist Dave Bangs has found Frog Orchids, Ling Heather and Waxcap fungal flora here. On the land to the south east of here the battle of Lewes was fought in 1264 between armies commanded by Simon de Montfort and the king. De Montfort’s men camped under the northern lee of the downs and climbed the downs in the early morning, forcing the King’s army to fight uphill. The battle was centred on an area by the old Lewes racecourse, but the bodies of those killed are buried all over this area. 8) Turn left here. The Blacksmith’s Arms (D) is straight ahead if you want to eat or drink. Cross the road very carefully. Traffic comes fast round the bends to the right and left. Opposite the pub walk down a road heading east, past the church. This turns right. In about 20 metres it turns left, but keep straight ahead on a track, which enters the woods. 9) Follow this track for about 400 metres and then turn left on a path beside a drainage ditch. This path can be muddy after periods of heavy rain. Walk under the railway and then turn right at the river Ouse. Walk along the riverside path, with fine views of Lewes, until you reach a bridge across the river. 10) Don’t cross the bridge. Instead turn right along a tarmac path. Pass the Pells Pool (E) on your left, the oldest open air swimming pool in the country. Head up the road ahead of you. Next to the church the road divides. Take the left hand branch, still keeping straight ahead. Cross a main road and head straight ahead again up Castle Banks. Turn right at the top and then left on a lane between the bowling green and the castle. Pass through the castle gate and descend to the High Street. Turn left here and walk to the traffic lights. Here you will find the tourist information office (F) which can tell you all about this historic town. 11) The route to the station turns right at the traffic lights and runs down Station Street (Beware, the pavements here are very narrow.) At the bottom of station street you will see Lewes station ahead of you.